Get the best US Masters odds online at Pinnacle. To properly assess the importance of experience to performance when making 2019 US Masters predictions, we need to control for each golfer’s baseline ability. 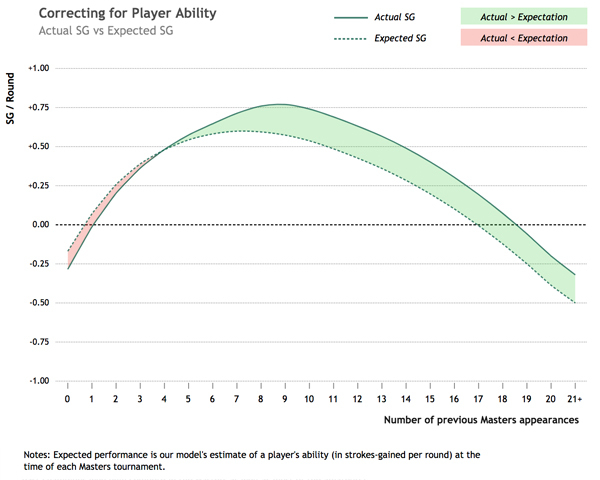 Using a statistical model, we are able to obtain estimates of each golfer’s expected performance at every playing of The Masters. For a rough intuition, think of a player’s expected performance as their average (adjusted) strokes gained at all tournaments throughout that year. For example, heading into the first round of the 2018 Masters, our model’s expectation for Jordan Spieth’s performance was 0.8 strokes gained over the field. (If this number seems small, remember that The Masters is a strong field.) Ultimately Spieth’s 66 was about 7.4 strokes better than the field’s average - meaning Spieth performed 6.6 strokes above his expectation in that round. This next plot includes expected performance alongside actual performance as a function of experience. Only the fitted curves are included for clarity - just as in the plot above, the averages by experience bounce around these curves. 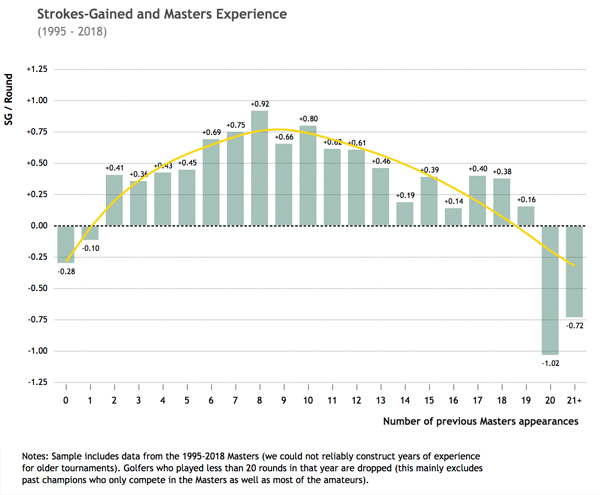 The difference between expected strokes gained and actual strokes gained is an estimate of the effect of experience on a golfer’s performance at The Masters. Now, let’s briefly discuss course history when making predictions for the 2019 US Masters. 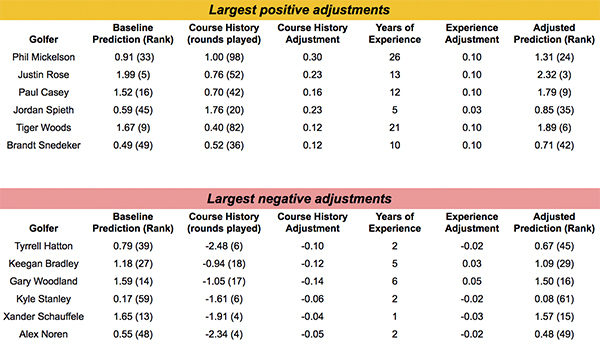 As in the experience analysis, to assess whether or not a player’s course history has predictive power we look at golfer performance relative to expectation. The question to ask is: does performing above expectation at a course in the past predict above-expectation performance in the future?